Art needs and deserves an audience and advocates. In our newest series, the ArtsNow Patron Spotlight, we’re putting the stories of our local arts patrons front and center. Today, we meet Mark Munoz + Jon Fiume. Jon and Mark are long-standing patrons of the arts in greater Akron. 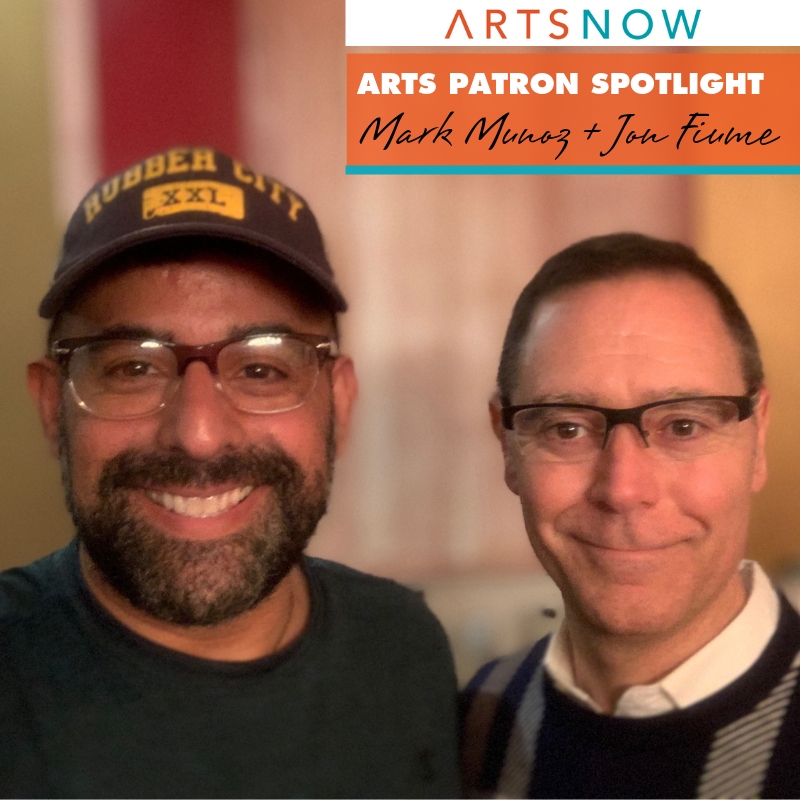 From Mark’s own career as an artist, to Jon’s commitment to using his position at Mustard Seed to advocate for the arts, to their personal collection of art from across the county and the world- Jon and Mark can teach us all about how the arts can impact our daily lives. JF: My earliest memory would be summer camp where we made God’s eyes with yarn and popsicle sticks. For whatever reason, I was mesmerized with them. Probably the colors. MM: Looking at a brochure containing Robert Mapplethorpe photography. His artwork, although controversial at times, is avant-garde and caught my eye in an artistic way. What was your first introduction to the arts scene in Summit County? JF: My first introduction was going to see a Michael Stanley concert at Blossom Music Center. I was underage if you know what I mean. MM: My first experience was attending the Akron Art Museum’s wine auction. It was 10 years ago and I was here visiting Jon. At that time we were flying back and forth from California where I was living. How do the arts in Summit County impact your life? JF: For one, it is part of my job. We at Mustard Seed support local artists by showing their artwork as well as hiring them to perform on our stages. In addition, we have commissioned artists to create the artwork on our reusable grocery bags as well as some permanent installations in our stores. I am also quite aware that a community without a vibrant and robust arts and culture scene is more depressed economically and energetically for that matter. Economically, it can draw people to a community while at the same time, hopefully encourage others to remain. Arts and Culture brings life to a community. This life is experienced in simple ways from just driving by an institution such as the unique Akron Art Museum or Stan Hywet to being able to experience the sounds of jazz at Blu, Pub Bricco, or of course Mustard Seed. MM: They make me feel comfortable as I have had places to showcase my photography. There are a lot of artists here and I believe the art scene has great momentum that only keeps growing. What artist or arts organization in Summit County do you wish more people knew about? JF: Honestly, Tuesday Musical. I feel like the younger generations have no idea about Tuesday Musical and not only their history in Akron and its influence on arts and culture, but also the quality program that they bring to today’s art scene. MM: The Nightlight cinema in downtown Akron. Besides showing some of the most unique and cult films, the place is intimate allowing you to fully enjoy the movie. And it offers a great gin and tonic! What is a “can’t miss” Summit County arts experience? JF: Hands down Stan Hywet. It is an Akron icon known as an historical home, but it is much more than that. The amount of different experiences available will peak anyone’s interest. You can be walking your dog, enjoying a car show, strolling the holiday lights, or attending the annual gala, the place is amazing! MM: Although many might not see it as art per se, for me it is the Summit Metro Parks. During my hikes, typically three or more times a week, it provides the most beautiful backdrop, and for my photography side, it provides countless subjects.